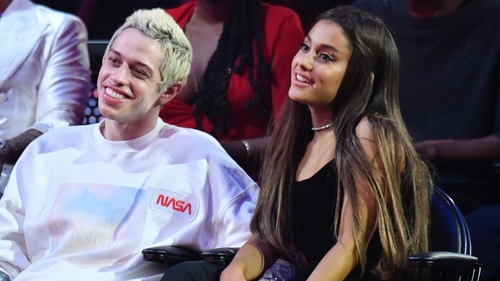 Pete Davidson has broken his silence on his break-up from Ariana Grande, by returning to the comedy stage to make jokes about the tattoos they had gotten together while they were still engaged. The 24-year-old Saturday Night Live star made his first public appearance since the couple called off their engagement when he took part in a charity comedy show run by Judd Apatow in Hollywood. Speaking about the handful of tattoos he got in tribute to Grande, Davidson told the crowd, "Um, I've been covering a bunch of tattoos, that's fun. I'm f***ing 0 for 2 in the tattoo [department]. "Yeah, I'm afraid to get my mom tattooed on me, that's how bad it is." "So, obviously you know I, we broke up or whatever but when me and her first got engaged we got tattoos," he continued. "And it was like in a magazine like, 'Was Pete Davidson stupid?' And 93% of it said yes. "So my boy, he was like, 'Don't listen to that s*** man. They're literally f***ing haters.' And I'm like, yeah, f*** that. I'm not stupid. And the other day we were in my kitchen and he was like, 'Yo bro. Turns out you were stupid'." He added, "Does anybody have any open rooms? Looking for a roommate?" Grande was recently seen covering up one of her tattoos about Davidson with a plaster when she made a recent appearance.